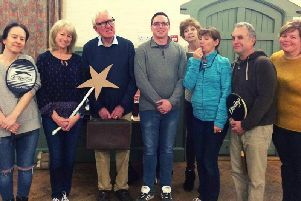 A strong cast of eight from Brackley Players present their autumn play, A Kick in the Baubles, at Southfield Primary Academy from Wednesday to Friday October 24 to 26. The play promises to be a wonderful, heart-warming and earthy tale of a typical family at Christmas. The cast, who have been rehearsing for since August, will be presenting audiences with a typical family at Christmas, with character Frank Bailey, played by Peter Milne, as the ‘Bah humbug’ of the occasion. With his snooty sister-in-law Doreen - played by Fran Hollyoake - and flash brother-in-law Harry- played by Roy Frost - coming to stay, Frank’s Christmas is not quite what he was hoping for. Throw in a couple of unruly neighbours, played by Scott and Lisa Saffrey, and a bit of a family drama and you have the perfect escapist entertainment. A Kick In The Baubles is on at 7.30pm on 24th, 25th and 26th October 2018 at Southfield Primary Academy in Banbury Road. Tickets are £9 for adults and £7 for concessions and can be bought online at new.brackleyplayers.org.uk, in person from Davies and Partners, 12 Market Place, Brackley NN13 7DP or by ringing Keith on 07516 408897. Tickets also available on the door.